As a kid, that time when my mother was going to law school, I would sometimes stop playing to watch her study. From the edge of a hard wooden table as tall as I used to be, I looked on as she slowly and painstakingly write out her assignments on school-issued blue-covered notebooks using Parker fountain pens with blue and black Quink inks. I would stand still and in silence for quite some time, careful not to disturb her, as I follow the wet traces of words she just wrote turn dry on paper. I was fascinated! Little did I know I'd end up collecting fountain pens. I was in college when I bought my first fountain pen, a Sheaffer Legacy Heritage, along with a bottle of black ink. It happened at the bookstore a block away from the all-boys school I attended. I knew that I've always wanted to own one. As a teenager, I remember feeling very adult about the transaction. Through the years, I've managed to collect all sorts. I ink them, and I actually use almost all--in rotation. I often have with me four to five fountain pens at any one time, sometimes more, that are ready to use. I've come to love and appreciate many European, American, and Asian fountain pen brands and models, among them (in no particular order): Parker, Omas, Pilot, Namiki, Nakaya, Edison, Sheaffer, Montblanc, Lamy, TWSBI, Cross, Conway Stewart, Platinum, Bexley, Pelikan, Desiderata, Monteverde, Stipula, Jac Zagoory, Waterman, Conklin, Karas, Levenger, etc. With a personal collection that has grown to so much more than what I've expected, I have acquired a few treasured vintage fountain pens in near mint condition that works great, but I prefer to collect mostly modern pens. There's no particular theme to my collection. I simply collect whatever attracts my interest and whatever catches my fancy. The whole thing is a process of discovery. I get to fall in love over and over again. One important thing: I do my best to learn as much as I can about the pens in my collection--from its brand and model history, the materials used and the manufacturing process, its nib characteristics and ink feeding system, to all sorts of all other interesting trivia. From experience, no two fountain pens are exactly alike. Each somehow handles and writes differently. And strange as it may seem, I like each for different, particular reasons. Collecting fountain pens also means collecting inks, papers, and all sorts of writing paraphernalia. One cannot work without the other. Most pen brands have their own line of different color inks, but I also like inks from J. Herbin, Diamine, De Atramentis, Irushizuki, among others. I have writing papers, journals, stationaries, and notebooks from Field Notes, Clairefontaine, Midori, Rhodia, Moleskine, Crane, Hammermill, Georgia Pacific, Satchel & Page, etc. Then there are all sorts of pen cases and rolls, inkwells, sealing waxes, rocker blotters, replacement parts, cleaning and tuning supplies, and on and on. It's an ecosystem all on its own. In this digital day and age, using and owning and collecting fountain pens along with its countless accouterments seems decidedly archaic. But there's something about the ceremony and ritual of wielding a fine writing instrument that is oddly satisfying, and I've come to know and meet many like-minded people from all over the world who today also collects, appreciates and values fountain pens not only for their utility but also for their beauty. 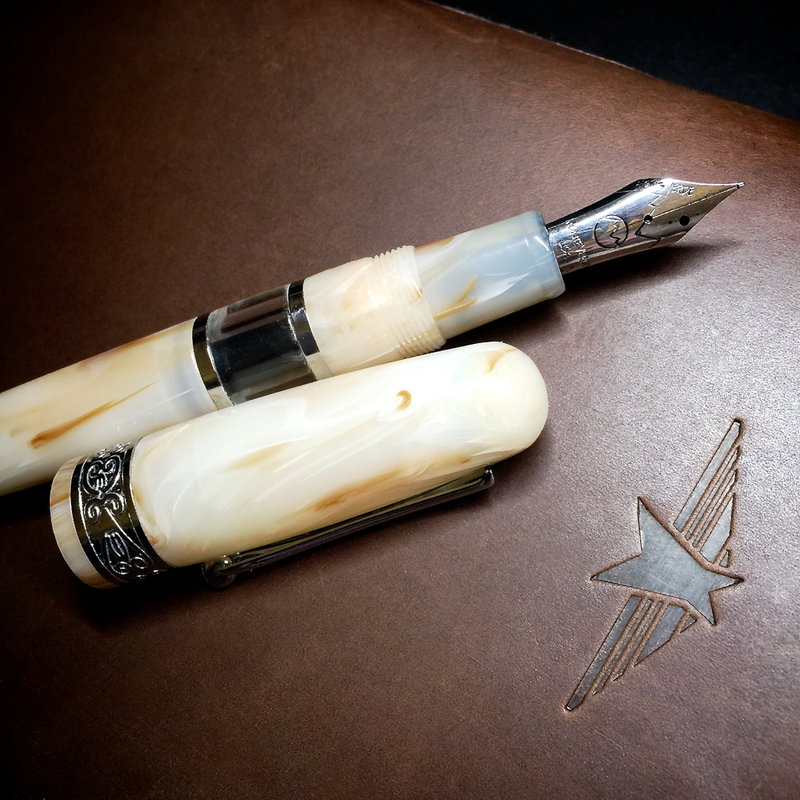 If you are interested in learning more about fountain pens, check out the largest and most active international community of enthusiasts and collectors at an online forum called The Fountain Pen Network. There's also an interesting podcast you can subscribe and listen to called The Pen Addict. And if you are considering owning and collecting fountain pens, go to The Goulet Pen Company, Edison Pen Company, and Classic Fountain Pens.